Are the Clippers a better team without Chris Paul? Let’s not even entertain that idea. 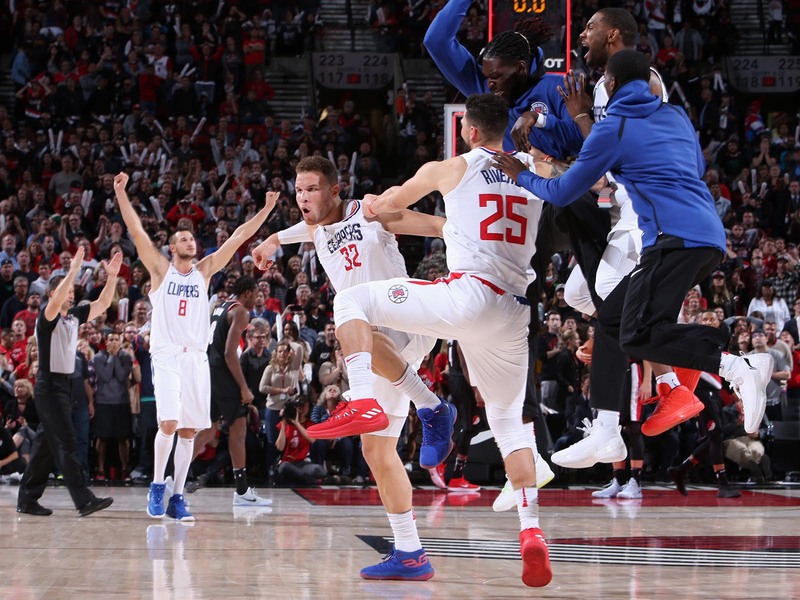 But the team's 4-0 start has proved one thing: Blake Griffin and his new teammates are certainly more fun to watch. Even in the midst of the most successful era of the franchise, there was still something very hateable about the Clippers. Chris Paul dribbling...and dribbling...and dribbling. Doc Rivers’s comically hoarse voice. Players complaining en masse after every foul. A bench filled with players who would be over the hill in Ice Cube’s BIG3 league. Chris Paul still dribbling. It became all too easy to dislike the Clippers, even when they played textbook defense and ran one of the most efficient offenses outside of Golden State. When Paul, after six years in L.A., finally left this summer, the Clips took a risk, re-signing Blake Griffin (and his injury history) and deciding not to rebuild in the uber-competitive West. With unclear expectations headed into this year, the Clips have outperformed even the best predictions in the season’s first two weeks. Los Angeles has started the season 4–0, including a thrilling win over the Blazers on Thursday night. Griffin secured the victory with 16 points in the fourth quarter, including the game-winning three as time expired. Are the Clippers a better team without Paul? Let’s not even entertain that idea. But there’s certainly something more aesthetically pleasing with this current version of Lob City, and that starts with Griffin, who’s been given the keys to the franchise. When fully healthy, Griffin is simply a problem for the rest of the NBA. With Paul gone, Blake is aggressively initiating most of the offense for the Clips. He’ll run pick-and-pops with Danilo Gallinari, looking for open shooters on the perimeter, or commanding a switch onto a smaller defender he can bully in the post. Griffin’s handle can at times be tenuous, but he still has the quickness to blow by centers, and he doesn’t hesitate putting smaller defenders on his back as he forces his way to the hoop. Blake’s burgeoning three-point game also makes it untenable to sag off on him, putting even more pressure on opponents. In the absence of a militaristic point guard, the Clippers’ offense is much more predicated on movement. Griffin and Gallo slither around off-ball screens. Patrick Beverley is either running pick-and-rolls or crashing the offensive glass. And DeAndre Jordan still commands attention as a rim-runner. Beverley’s addition to the team provides the most obvious contrast from the Paul-led units of yesteryear. While Paul preached precision, Beverley is an agent of chaos. He’s not afraid of wild forays into the paint, and when you least expect it, he’ll emerge among a sea of limbs for a put-back basket. Beverley’s defensive energy knows no limit, and his little hustle plays—fighting over a pick late in the shot clock, saving the ball for an extra possession—make a world of difference. With Blake firmly in position as the team’s leader, others seem to be embracing their roles. Elevated to the starting lineup, Austin Rivers has continued the career renaissance he began last season and is making himself a valuable contributor. Lou Williams is a better version of Jamal Crawford than the one the Clips had last season. And even second-round pick Sindarius Thornwell has spotted Doc a few solid defensive minutes in the absence of passing savant Milos Teodosic. Griffin, however, will always be the biggest catalyst for the team’s success. Blake long ago shook off the label as someone who was just a flashy dunker, but his game has improved leaps and bounds over the last few seasons. Griffin could always burrow his way into the paint, but the amount of work he’s put into his jump shot is finally paying off. Gone are the days of Griffin bricking wide-open threes and purposely being sent to the free-throw line. After never averaging over two three-point attempts per game in a season, Griffin is shooting nearly six shots from three to start this season, connecting 43% of the time. Blake showed off the full repertoire in the win over Portland. In a back-and-forth contest, he tallied 16 in the final quarter. Multiple times he muscled his way into the lane for a shot at the rim. With Jusuf Nurkic switched onto him, Griffin drove right past him into the paint. And given a little space on the final possession, Griffin confidently rose up to drain the winning three. The sequence was a culmination of Paul’s departure, Griffin’s health and the steps Griffin has taken to modernize his game, as well as a perfect encapsulation of Blake’s potential as a clear-cut No. 1 option. So is L.A. a better contender now than it was the last six years? Not quite. You typically can’t lose a top-end talent like Paul and come out better. The bench is still razor thin. And Doc is running his starters into the ground. Everyone is playing heavy minutes, even though three of the Clips’ wins were blowouts. With Teodosic out, the rotation has shrunk to about eight, depending on how long of a look Thornwell gets. If Rivers wants to keep his most important players healthy, it may be time to show some trust in the likes of Thornwell and Sam Dekker. The Clippers exited Thursday with the No. 1 net rating in the NBA and the best defensive rating by a mile (aided greatly by big wins over some of the West’s lesser teams). L.A. will likely soon fall back into the middle of the conference pack. Still, after losing the player that anchored their franchise for six years, the Clippers at least have some understanding of how they’ll move forward. And people may even like what they see this time.